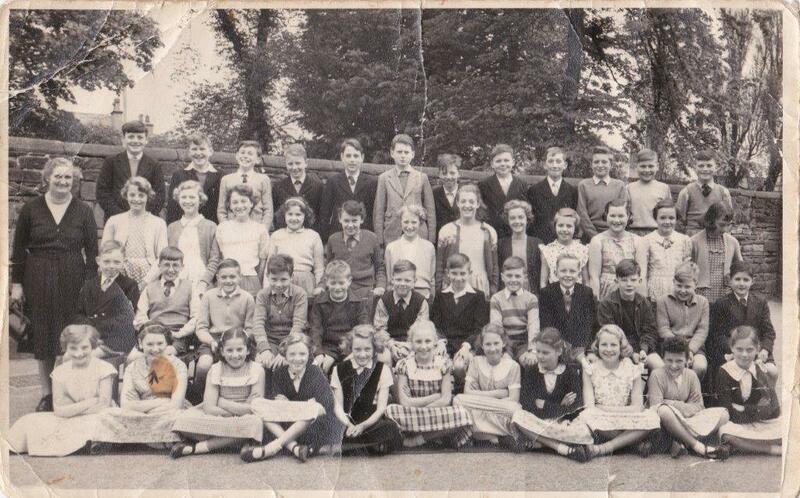 Rainhill St Ann's School, 1957. Second row: Miss Baldwin, Susan Seddon, Ann Mather, Elaine Macdonald, Angela Dodd, ? , Barbara Royle, Vivian Pye, Barbara Dixon, Lily Thompson, Barbara Hewitt, Margaret Fairclough, ? . Third row: Jimmy Fishwick, ? , ? , ? , ? ,John Button, Ian Stirrup, ? , Dave Grundy, Maxwell Leighsett (Lycett? ), John Swire, ? . Front row: Pat Gilbert, John Beardsmore, John Mills, Elizabeth Webster, Pauline Orford, Pat Leight, Barbara Eden, Audrey Bennett, Mavis Beesley, Lillian ?, Barbara Ivady. These names have been supplied by Pauline Linkich (nee Orford), now in Australia, and John Corns.